Where, oh where, is that bear? Where's My Teddy?' 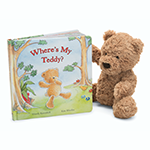 is just the tale for tots who love their bear to bits. Gorgeously drawn and sweetly told, it's a story about friendship and teddy loyalty. Pair it with Jellycats Bumbly Bear plush (Sold Separately) to make a great Birthday, Baby Shower, or "Just Because" gift.